One day that'll be me up there. I went into a bookstore the other night and reserved a copy of a forthcoming book. It was just as easy as doing the same thing on Amazon. It was cool, too. I talked to the clerk behind the counter and told him which book I wanted (Black Country by Alex Grecian) and wondered when it was coming out. The good-natured fellow looked up when it was coming out (May 21st he told me) and then asked me if I wanted to reserve a copy. I thought it over and finally said 'yes' and he took out a card, wrote down my name and phone number and it was that easy. He also told me how many copies they'd already reserved and I was happy to've given my business locally. I'm sure my purchase (in May) will contribute to the continued life of the store and hopefully the livelihood of the clerk. 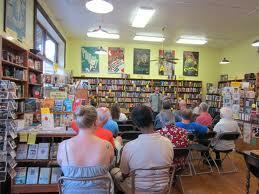 The store is an independent bookseller and they've been around a long, long time. They survived the arrival of Hastings way back when, then survived Borders moving in across the street and outlasted them, too. I felt great. I was reminded of adding a title to my comic book pull-list. The exciting part is the anticipation. Yeah, it's going to be out of mind here in a couple more days, but I'm going to get a phone call from a person when my book comes in. It's not an automated process, it's humanized. Which is cool because Alex is a human. Other humans worked on the book, too. The book will be shipped by humans to humans who will accept it and sell it to other humans. Ever thought about how many hands touch a product like a book? Dozens, at least. I was in the neighborhood buying coffee beans around the corner and I stopped in the bookstore on a whim. Yeah, I could have pre-ordered the book from Amazon and it would have been delivered to my door, but I'm contributing to my local economy by purchasing from this bookstore. Which helps keep them in business. Which makes my town more viable. Wouldn't it be cool if someone else who was downtown could just drop in someplace and buy my own books? Wouldn't it be even cooler if they did and walked out of the store with them? Yes it would. I can only imagine the feeling of knowing how many books have been pre-ordered and someday I'd like to do a reading in a bookstore. To see the faces of people giving my words their attention and then see their reactions would be a dream come true. This leads me to the point of this post: I've decided to pursue traditional publishing routes. There's been quite a lot of hooraw over some epublisher's contracts that seem to be masquerading as a 'new business model' and that tipped me over back to this idea. (John Scalzi, the outgoing president of the Science Fiction and Fantasy Writers of America has covered it extensively and this post here is where I think you should start.) I know where the novel is going to go at the end of April. I know where it'll go next if that publisher doesn't like it. And the next and the next. I don't have anything against epublishing, not at all. My friend Rachel is with one of the better ones. But I want people to go to bookstores and find my books. I like browsing bookshelves and I know a lot of other people, do, too. I believe in my book and I 'm sure it's going to sell. I'm prepared if it doesn't, but those preparations are set aside because I won't need them. So, by announcing my intent I hope that it comes true. I'm going to do everything I can to ensure that it does. One day, you'll be able to walk into a bookstore and ask the helpful clerk when my new book is coming out. When you're asked if you'd like to have a copy reserved for you, you'll be able to say yes.